How the experience of war impacted on the town, from the initial enthusiasm for sorting out the German kaiser in time for Christmas 1914, to the gradual realization of the enormity of human sacrifice the families of Leicester were committed to as the war stretched out over the next four years. A record of the growing disillusion of the people, their tragedies and hardships and a determination to see it through. Leicester had a strong radical tradition, and was represented in Parliament during the Great War by the outspoken Labour MP Ramsay MacDonald. MacDonald's anti-war views divided opinion in Leicester sharply, but whilst it was slow to provide troops for Kitchener's Army, this was not through lack of patriotism. Instead, Leicester's three main industries - footwear, hosiery and engineering - all had bulging order books as a result of government war contracts. 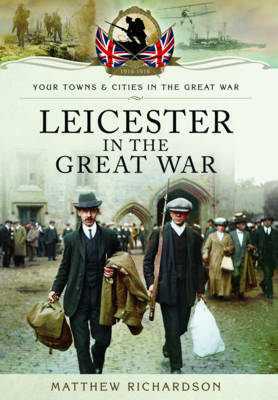 Bravery on the battlefield, strikes at home, conscientious objectors and the great flu pandemic were all part of Leicester's story in the Great War, and all are covered in this book.